Nautical Premium Teak Wood Handcrafted Nautical Ship Wheel Mirror with a edged rope on the inside of the wooden rim. This is a beautiful Home decor product and adds a completely new definition to your decor ideas. Designed and crafted exclusively by Nagina International's artist. This is a true consequence of art and passion. 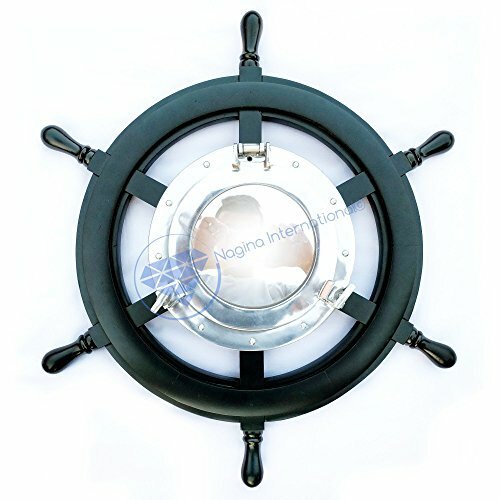 Wooden Ship features a flat simple mirror which is attached inside the shipwheel using the appropriate hardware. Necessary wall mounting hardware are also included inside the box so that if you wish to hang it out , you won't find it hard. PLEASE NOTE :: We do premium packaging with extra cushions and padding so that the mirror reaches you safe and in single piece , larger wheel sizes features larger mirrors so we do provide extra care and packaging for those ones , you don't need to worry about its breakage during transit. As it is a fragile stuff so there could be 1 complain out 1000 and we do provide the replacement/refund for that unfortunate broken mirror. We have got many more sizes and colors available. Keep Exploring Nagina International for more Home Decor choices.